Come enjoy the 7th Annual National Pie Day Pie Party! Bring a pie to add to the pie buffet for admission or donate $10 at the door to The Marsha Rivkin Center for Ovarian Cancer Research. Sweet or savory; it's dinner and dessert. 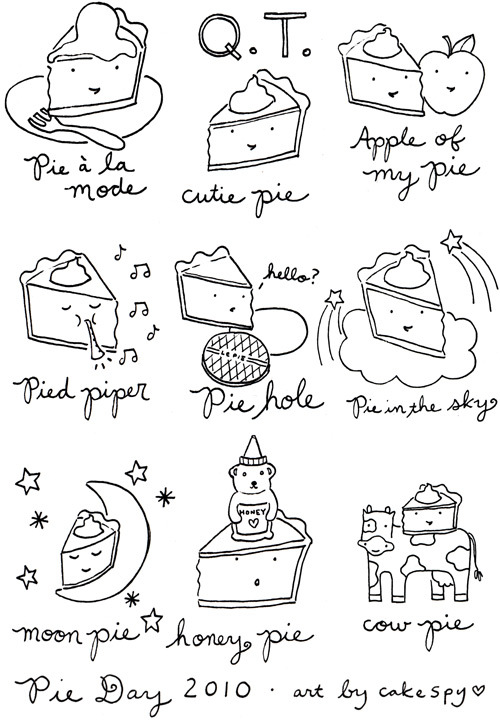 Enjoy a set by pie song cover band The Fillings, shop for pie-pharnalia at the silent auction and snap up a limited edition t-shirt custom created for PP10 by the lovely Cakespy (tee design pictured at top)! Children are welcome. Full bar available at the Eagles. Let's roll out some dough! National Pie Day is coming right up on January 23rd and we've got some great specials, discounts, and new flavors coming, too! We'll be introducing our new Chocolate/Oatmeal/Craisin and Broccoli/Mushroom/Cheddar flavors plus a one-day-only Pie Day special flavor: Apple/Cheddar/Rosemary....it's pretty off the hook! Experience all that awesome at Fuel Coffee locations (and keep updated on any further developments via Twitter!). Mini Empire Makes its Grand Debut at Porchlight Coffee, Capitol Hill, Seattle: Aren't you dying to try Mini Empire's lilliputian baked goods (which were recently announced via Capitol Hill Seattle and Seattle Weekly)? Happily, this special order bakery is making its retail debut on January 23rd, when they start selling their sweets at Porchlight Coffee in Capitol Hill. The Mini Empire crew will be giving out free cup-pie samples from 12-5, and some lucky souls will win their pies in mason jars! Of course, if this isn't enough pie related goodness for you (or if geography is going to keep you from attending any of these awesome events), check out upcoming pie events on the American Pie Council (yes, it exists) website, or check out some ideas for other ways to celebrate.